YOUNGSTOWN, Ohio (CNS) — Bishop George V. Murry of Youngstown has announced the names of 31 clergy and one religious brother who served in the diocese since its founding in 1943 who have been credibly accused of sexual abuse of a minor. The bishop had promised to release the names by early November. At an Oct. 30 news conference in the diocesan chancery building, Bishop Murry released the names of the 27 diocesan priests, one diocesan deacon and three religious order priests who had served in the diocese. He also released the names of two priests from the Diocese of Pittsburgh who had been removed from ministry but who resided in the Youngstown Diocese after their removal from ministry, and also Franciscan Brother Stephen Baker, now deceased, against whom a number of “credible accusations” were made when he served at Warren John F. Kennedy High School. Bishop Murry emphasized that all credible accusations have been reported to civil authorities and that all of those accused had been removed from ministry years or even decades ago. Of the diocesan priests accused, 18 are deceased, including nine who died before any accusation was filed. Two of the three religious also are deceased. 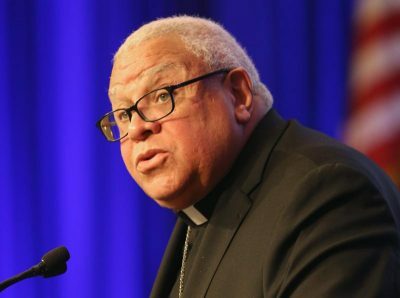 Bishop Murry expressed his profound regret and sadness for the actions of those who had served for the diocese, noting that their actions constituted a betrayal of trust which afflicts the larger church as well as the individual victims, who have suffered most profoundly. He also said that the church in many cases may have failed those priests who have been accused by not preparing them properly. Now, all seminarians are subject to extensive psychological testing and examination to ensure that they are prepared. “I have met with our seminarians” to further that process of discernment. The number of priests who have served in the diocese since 1943, Bishop Murry explained, is 551 diocesan priests and 474 religious order priests, for a total of 1,026. Those accused of abuse constitute three percent of the total. He contrasted that with four percent of priests nationwide who have had a credible accusation made against them, according to a John Jay College study. “Four percent is too many. Three percent is too many. One percent is too many,” Bishop Murry told reporters. He also expressed concern for the vast majority of priests who he said serve faithfully but suffer by association with those who have been accused. Bishop Murry emphasized that it is imperative that these names be released to show the church’s commitment to transparency and to doing all that can be done for the victims. “I’m concerned that some church authorities do not understand how serious” the problem is, he said. In response to a question, Bishop Murry told of recently communicating with about 20 bishops. “The bishops I have talked to feel very strongly that we have to hold bishops accountable.” He noted that that question will be addressed at the U.S. bishops’ meeting Nov. 12-14. In the Youngstown Diocese, Bishop Murry emphasized the efforts of Msgr. John Zuraw, diocesan chancellor who oversees the diocese’s Safe Environment Program, and retired Detective Sgt. Delphine Baldwin-Casey, diocesan victims’ assistance coordinator, to meet with victims. “I have met with many victims” and will continue to do so “to ask them how we can help,” Bishop Murry explained. The diocese is willing to provide and has provided such assistance as counseling and help with medical expenses related to any abuse. Bishop Murry said he hopes that announcing the names of those who have been accused will help encourage any victim who has not yet come forward to do so “so that we can help them.” The diocese reports all credible accusations to civil authorities and encourages victims to do the same. In response to a question, the bishop said that the diocese has paid out about $500,000 in settlements to victims. He noted that the money for such settlements comes from diocesan investments and interest from savings, not from parishioners’ contributions or parish assessments to the diocese. When asked about how recent any of these allegations are, Bishop Murry said that the most recent accusations involved Brother Stephen Baker, which came out in 2005. All clergy or any other person working in the church who has faced a credible accusation has been long removed from ministry and to the best of the diocese’s knowledge, none are now serving. “This a rolling ball,” however, Bishop Murry added, and it is possible that further accusations will come forward. He indicated that the list will be updated if others are accused in the future. At the same time, the bishop expressed hope that, through the various efforts that the diocese has taken, such as the diocesan Safe Environment Program, which includes background checks on all church employees who might have contact with minors, Virtus training (in awareness of child abuse prevention) for church employees and volunteers, and other safeguards established through the “Charter for the Protection of Minors” established by the U.S. bishops in 2002, such cases can be prevented. Following the news conference, Msgr. Robert Siffrin, diocesan vicar general, met with diocesan employees in the St. Columba Parish Hall to inform them of the names of those clergy who have been accused and answer questions. Bishop Murry sat in on the meeting and thanked diocesan staff for their service. Editor’s Note: The full list of priests’ names can be found posted on the diocese’s website. Sheehan is editor and general manager of the Catholic Exponent, newspaper of the Diocese of Youngstown.